As usual I am way behind with my posts and have been very slack lately but I am determined to get though them all. Mostly I am determined that I must finish all the posts from our recent trip to Bangkok. Obviously that plan was that these posts would be written while I was relaxing on the balcony with a can of Singha in hand but it didn't work out that way. Well, writing the posts didn't, I can't say the same for the can of Singha! I have a lot of good things to say about the Thai food in Melbourne which just seems to be getting better and better by the day. Lately I am finding (or being recommended) new places very regularly, so many that I am having trouble keeping up! If I have to choose one dish that still has a way to go until it gets close to that quality you get in Bangkok it would have to be Thai soup noodles. Most places either don't offer it or take the easy option of constructing their broths with a base of pre-made powders or pastes. This is fine for cooking at home (hey, I use them too) but personally I think a restaurant should avoid these short cuts. 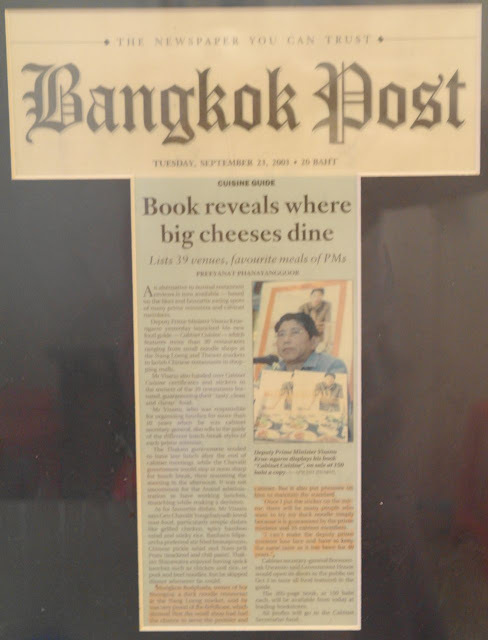 It's for this reason that I really try and seek out as many noodle soups as possible when I'm in Bangkok. The depth and sublime quality of the broths is just amazing. 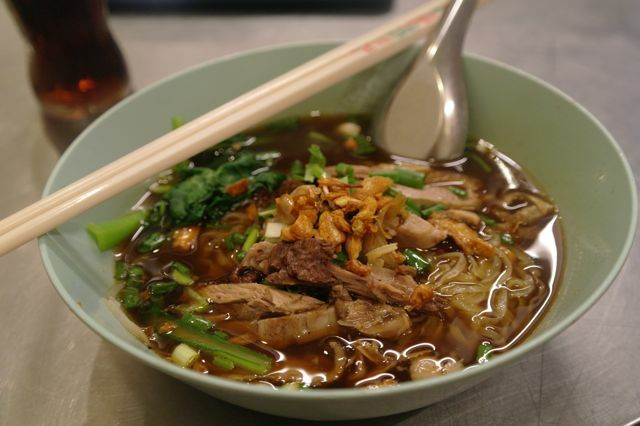 I love most Thai noodle soups but my favourite by far has to be Kuay Tiau Bamee Ped (Duck with Egg Noodles). We had this a number of times from a vendor at Soi 38 on our previous trip and sadly our attempts to find something similar on our return to Melbourne yielded nothing of any note. 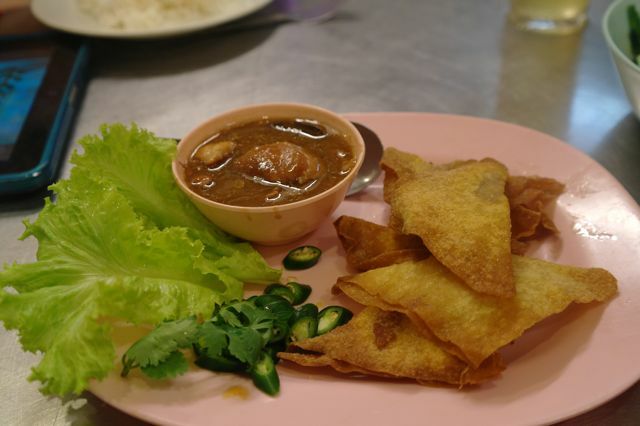 Aside from the divine broth, what set the Thai version apart was the tender fall apart braised duck. I've never tried anything like it outside of Thailand. Roongroj is right next to the wonderful Nang Leung Market. If you are staying in or around Banglapmhu, Nang Leung is about a 5 to 10 minute tuk tuk ride and probably a 20 minute walk from our hotel on Phra Artit. The market is just fantastic, akin to some kind of open air food court and wet market all rolled into one. 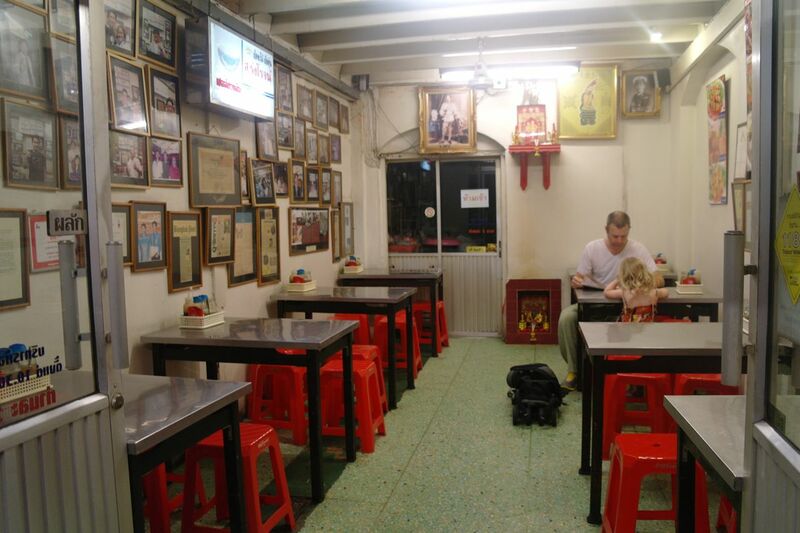 At the busy times this place just hums and with so many vendors occupying their little booths you can get most of the your favourite Thai meals in the one place. As it's where the local eat you can be comfortable that the flavours are not westernised in any way. I found Roongroj in the back pages of my Top 50 Street Food book with the simple description 'Duck Noodles' and that was enough for me. We hailed down a tuk tuk who knew of Roongroj (always a good sign), although he pronounced it more like 'Loonlot' and we arrived around 8:30, just before closing time. I get the feeling that duck noodles are more of a lunch dish as the place was totally empty and although this would usually deter me I trusted in Chow (Top 50 author) as she has never steered me wrong. 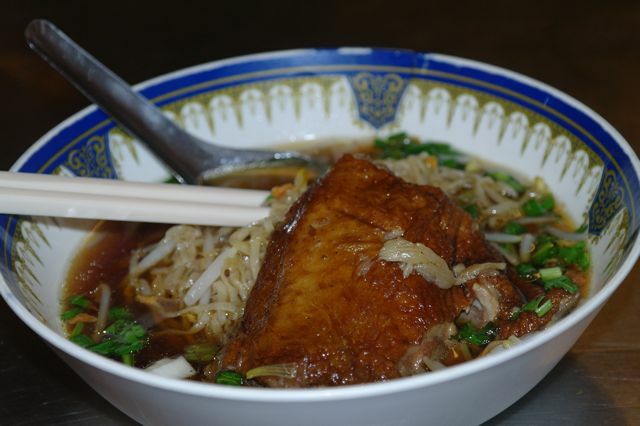 This was easily the best bowl of duck noodles I have ever tasted, yes big call I know everything about it was just perfect. Amazingly tender melt on the mouth delicious braised duck, gorgeous springy egg noodles and a sumptuously rich but somehow still light broth, just heavenly! To me noodle soups are an enigma as they are pretty much impossible to deconstruct and identify individual ingredients, its the balance and combination of the aromatics used that truly make them some kind of secret magical potion. We ordered these fried wontons with chicken in gravy for Charlie and of course snuck a taste for ourselves. Duck noodle soup is the Roongroj specialty but judging by the chicken in gravy I'm pretty confident that they everything they serve must taste amazing. That's the thing about Thailand, they're so passionate about there food that if you're serving Thai food to Thai people it better be good or you won't last long. There's just no place for mediocrity, even the places that the Thai say are just OK are good and the ones that they say are good are amazing.